To teach basic concepts of traffic safety, to provide injury prevention awareness and life safety skills for children entering the kindergarten grade level. Kettering Safety Village is a week-long transportation and life-safety program sponsored by the Dor-Wood Optimist Club. The City of Kettering’s Engineering Department Safety Section in collaboration with Kettering City Schools is proud to operate this program designed to teach our youngest citizens how to be safe. 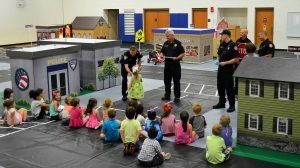 Safety Village instructors are joined by Kettering police, fire and school personnel to provide age-appropriate classroom instruction on a variety of safety topics to participants. Children get to practice and reinforce what they’ve learned at our indoor Safety Village, with child-size replicas of streets, intersections and buildings. Children also participate in a variety of additional activities, including a ride on a Kettering school bus and a “Safe Walk” in a neighborhood. Through classroom instruction and fun and exciting hands-on experience, young children will begin to develop safe habits for a lifetime. Kettering Safety Village registration fee in $20.00 for all participants. The class sessions will be held June 3, 2019 thru June 28, 2019 at J.F. Kennedy Elementary School. Online registration will open to Kettering residents on February 19, 2019 and open to non-residents on April 1, 2019.